Truffle, led by chef Tom Bickers, has taken over the kitchen at The King & Co in Clapham, serving a menu pertly based on their regular street food stand at Broadway Market. 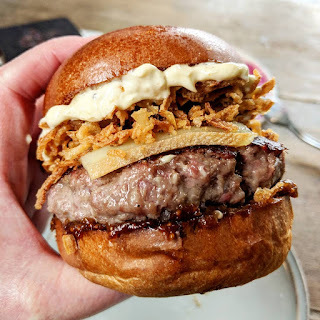 As you'd expect, truffles play a part in most of the dishes, and the menu at The King & Co will include such delights as a Truffle Scotch Egg, and a burger with truffle mayo (& raclette! ), plus bigger dishes like steaks. They are serving Mondays to Saturdays until the end of March (& as ever the pub does their own roasts on Sundays). "THIS month street food stars Truffle launch their first ever residency at award-winning Clapham pub The King & Co. Launched by trained chef Tom Bickers in early 2018, Truffle have made a formidable name for themselves on the streets of London in just 12 months, bringing the beautiful and notoriously expensive truffle to the masses with their inspired, tasty menu. Having made their name at street food markets and events with Kerb, Victoria Park Market and Street Feast’s National Burger Day, their highly-anticipated 10-week residency follows a successful sell-out stint at the South Banks’ renowned Christmas market. Known for their burgers, Truffle’s menu will showcase the full range of Tom’s talents when it begins on Monday, January 21. Visitors will be encouraged to share from a selection of small dishes and big plates such as such as Scallop, Mushroom, Burnt Butter Hollandaise & Truffle Crisp and Whole Roast Chicken, Stuffed with Foie Gras, Truffle & Brioche, Artichoke, Carrot & Tender Stem Broccoli. Also on offer will be showstopping 16oz Rib of Ex-Dairy Beef served with Boulangère Potato and Confit Garlic. All meat is responsibly-sourced using free-range chickens and dry-aged native breed ex-dairy cows. Tom, who has cooked at Restaurant Tom Aikens, Pollen Street Social and Restaurant Gordon Ramsay, said: “I’m obsessed with truffle and having worked in some incredible restaurants before going it alone, serving my food indoors was always an ambition. Alongside the regular menu Truffle will host a series of Tuesday night supperclubs and will also offer an exciting special menu for Valentine’s Day to showcase the more experimental side of Tom’s cooking. Since its launch in September 2014, The King & Co has earned a strong following, and was voted “Most Loved Local Bar or Pub” in the Clapham neighbourhood in Time Out’s Love London Awards 2018. Trusted for its extensive and carefully-curated daily-changing craft beer tap list, the venue has become equally well-known for its highly successful kitchen residencies by prominent London streetfood traders and popup chefs, which allow pub-goers the opportunity to experience a regularly-rotating spread of remarkable food. It has become known as a launchpad for many of the capital’s most exciting vendors including Juma Kitchen, Ghana Kitchen and Up In My Grill."